Deepen your understanding of the Presidio 27 through lm and a panel discussion with participants, scholars and other distinguished guests followed by audience Q&A. Immerse yourself in the experience of the Presidio 27 in the place where the mutiny occurred. Listen to the voices of participants, hear their stories, and learn about their relevance today. What is the Presidio 27? 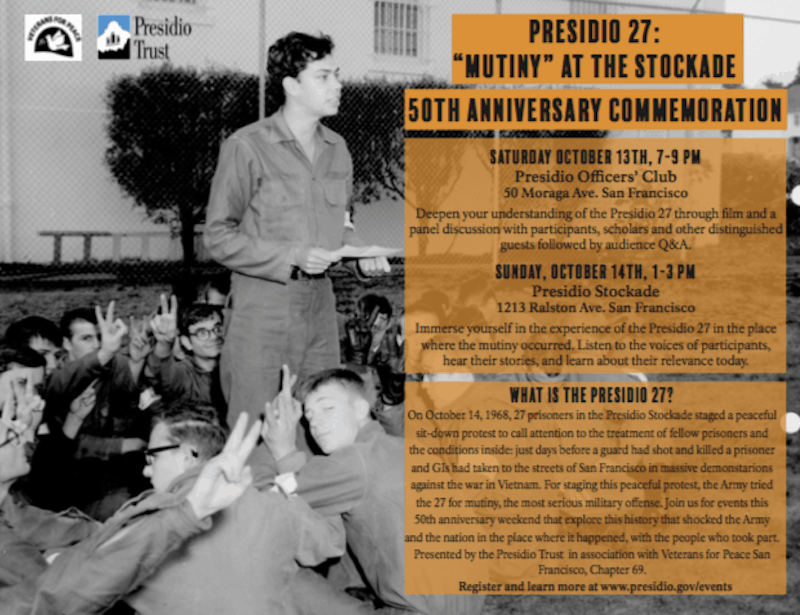 On October 14, 1968, 27 prisoners in the Presidio Stockade staged a peaceful sit-down protest to call attention to the treatment of fellow prisoners and the conditions inside: just days before a guard had shot and killed a prisoner and GIs had taken to the streets of San Francisco in massive demonstarions against the war in Vietnam. For staging this peaceful protest, the Army tried the 27 for mutiny, the most serious military offense. Join us for events this 50th anniversary weekend that explore this history that shocked the Army and the nation in the place where it happened, with the people who took part. Presented by the Presidio Trust in association with Veterans for Peace San Francisco, Chapter 69.